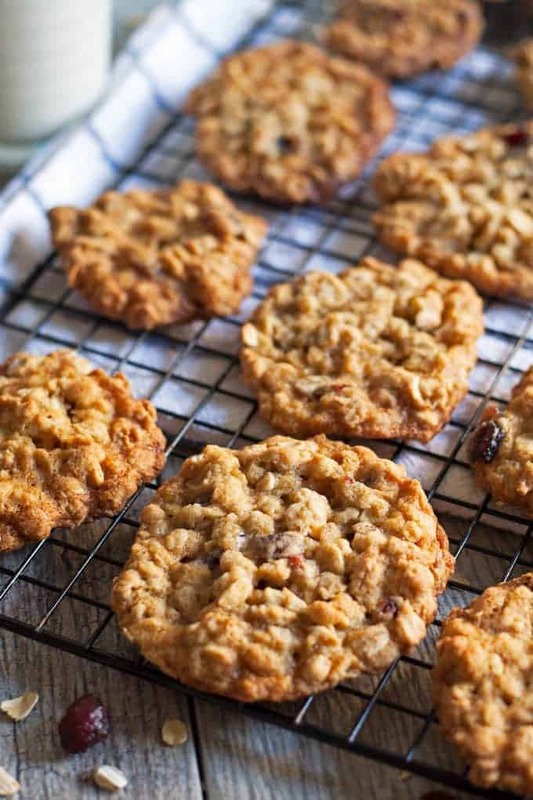 Add this recipe for oatmeal cranberry cookies to your holiday cookie rotation! They are easy to make, chewy and delicious! Thank you Bob’s Red Mill for sponsoring this post! Sparkle up your holiday season with more delicious recipes at BobsRedMill.com! I’m kind of excited that Christmas is around the corner. Last year, we got very busy and I realized, on December 21st, that we hadn’t put up the tree yet. The Christmas boxes weren’t brought up from the basement last year and I won’t let that happen again. The only thing I did that resembled Christmas was make a batch of butterscotch spice cookies. I am already in the holiday spirit, planning out our decorations and making Christmas cookies! When I was a kid, my mom and aunt would get all the cousins together at my aunt’s house and we would spend a full day making cookies. She still has the wooden table that we used to roll out dough for sugar cookies and that we all crowded around, both while prepping cookie dough and afterwords, while we anxiously waited for the cookies to bake and chill. Christmas isn’t Christmas unless some delicious cookies are baked. This year is a great year to try out a few new holiday cookie recipes and maybe create some memories for your family too. Instead of rushing and sticking with your same old boring recipes, try a new recipe out. 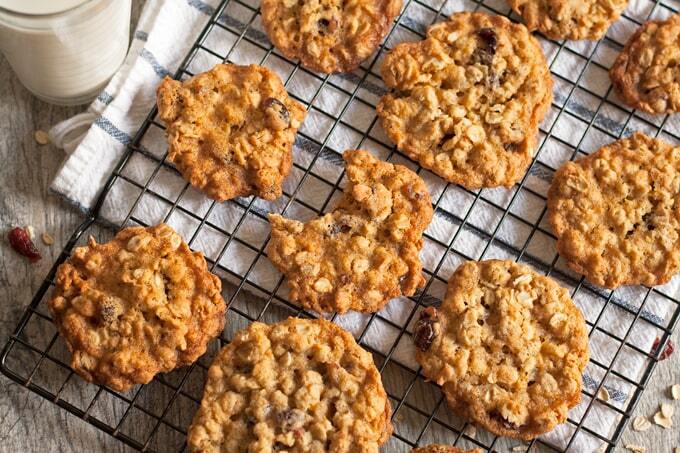 Like this recipe for oatmeal cranberry cookies. I made these delicious, chewy oatmeal cookies with Bob’s Red Mill Organic Unbleached White Flour. This kitchen staple is versatile and perfect for all of your baking needs, holiday and year-round. Bob’s Red Mill Organic Unbleached White Flour is freshly milled from Organic hard red wheat and is not enriched with any additives. Professional bakers use this high protein flour and it produces high, well-textured loaves of bread and light, airy baked goods! It’s my go-to organic white flour! Once you have your flour, it’s time to whip up some dough. 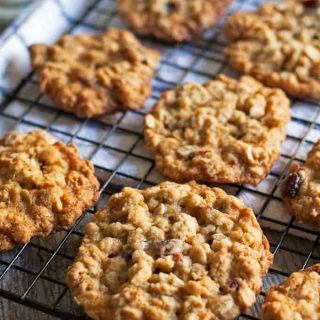 You need an electric mixer (either stand mixer or hand mixer) for part of this recipe, but kids could totally get in on the fun by whisking together the dry goods or stirring in the quick oats by hand. Place the cookies on baking sheets and then pop them in the oven. When you pull these cookies out of the oven, you are going to want to eat one right away. Wait. As long as you don’t over-bake them, they are going to be chewy and delicious when you let them cool. 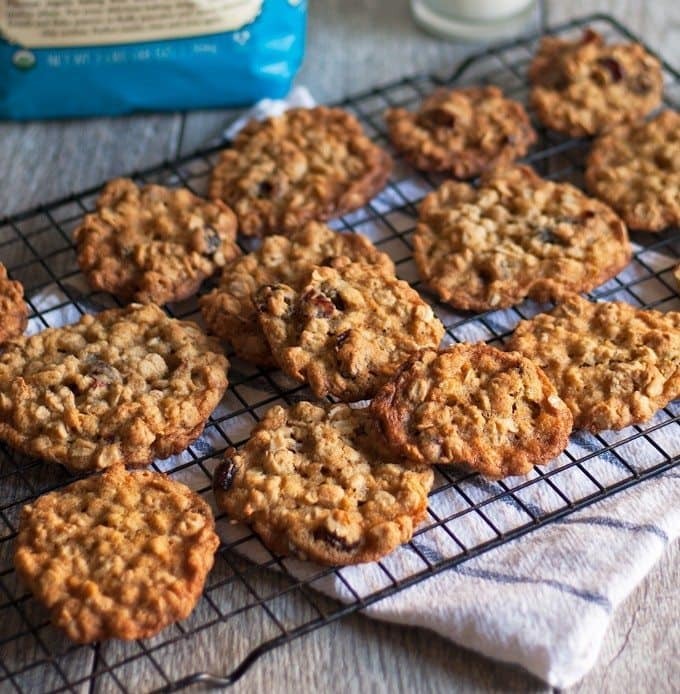 And, if you do over-bake them… well, you will then have crispy and crunchy oatmeal cookies instead! 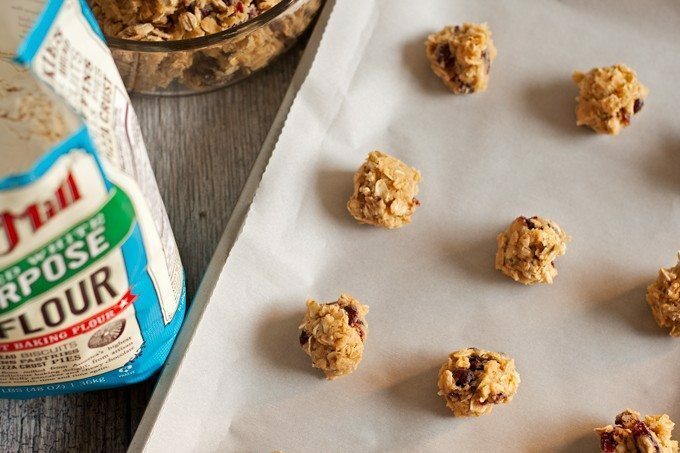 This oatmeal cookie recipe is going to be added to your Christmas cookie list for sure! Looking for more cookie recipes? Try my sea salt double chocolate cookies or butterscotch spice cookies! You can never have too many cookies. In a small bowl, combine the flour and baking soda and whisk together. In the bowl of a stand mixer, cream the white sugar, brown sugar and butters together until smooth. Add the eggs, one at a time, until mixed in. Add the vanilla extract, then reduce speed to low. Gradually beat in the flour mixture until just combined. Stir in the oats and cranberries until wet. Measure rounded tablespoons of dough and place them on your prepared cookie sheets about 2 inches apart. Bake for 12 minutes, or until the tops are golden. Remove from oven and allow to cool for 2 minutes, then transfer to a wire rack to cool. I love adding cranberries to holiday desserts – your cookies look delicious! 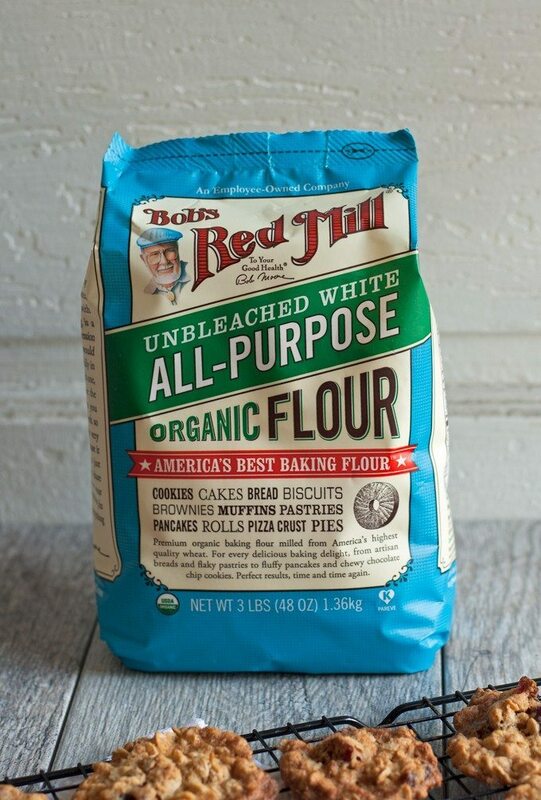 I’m a big fan of Bob’s Red Mill products, but I haven’t tried the flour before. Adding it to my list. I love Bob’s Red Mill products and these chewy cookies look like holiday perfection! My girls would love these, they’re pretty much obsessed with dried cranberries. And cookies, but who isn’t?! I can’t believe that Christmas is almost here! I feel like we just cleaned up from last year haha. Your Christmas cookies looks fantastic! These look like the perfect sweet and chewy cookies!! I love that you added cranberry! Love this flavor combo! Bob’s Red Mill is the absolute best. I’m totally trying these, Jenny! I love oatmeal cookies but usually just add butterscotch chips. Cranberries are so much more festive for the holidays! Bob’s Red Mill is my favorite! Have you tried their ivory (white) whole wheat?! It’s amazing! And so are these cookies. They look absolutely delicious! I agree! The holiday season doesn’t begin until I start making cookies! I’ve always been a fan of Bob’s Red Mill. Their flours are great! This looks like a delicious combination! Thank you so much for coming over and sharing your recipe with us at Snickerdoodle Sunday. Pinning and tweeting to share! Sounds like a great flavor combination! Thanks for sharing on the What’s for Dinner link up and don’t forget to leave a comment at the party – Next week’s features that also leave a comment get pinned and tweeted! Yum- I’ve been looking for new holiday recipes! These cookies sound good and I bet they smell wonderful as they are baking. Thank you so much for sharing at Snickerdoodle. Perfect for fall and Christmas Cookie Exchanges, definitely pinning this for later. Thanks for linking up to the Creative K Kids’ Tasty Tuesday, I can’t wait to see what you come up with next week! I’m not much of oatmeal cookies, UNLESS they’re mixed with fruit or chocolate. I’ve had one where it was crandberries and white chocolate as well as this version and both of them were delicious! Thanks so much for sharing this with us on #shinebloghop this week! Love Bob’s Red Mill products, and these cookies look wonderful. My husband loves oatmeal cookies, pinning to make these! I’ve been eating a lot of WEndy’s oatmeal bars lately, and these look the same! YAY! 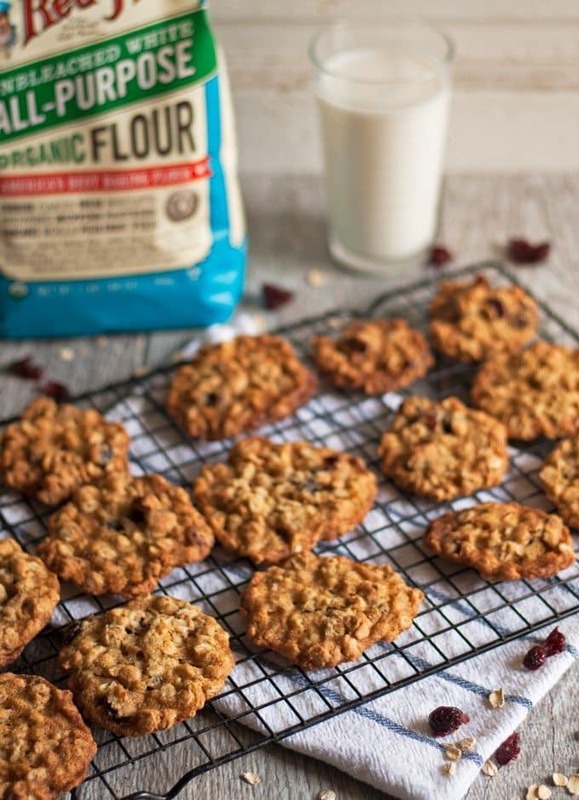 I love the combination of oatmeal and cranberry, these cookies look fantastic! Thanks for linking up with Pretty Pintastic and hope you join us for Small Victories Sunday Linkup too, which runs all week long across 12 blogs! I love me some oatmeal cookies! These look super good! !